I'm ashamed to say that I haven't used toner in decades. Yup. Virgin toner-free face. That probably explains the blackheads (or should I say crater-heads) and blemishes too. Let's just say that I'm in the process of hunting down a bottle of organic unfiltered apple cider at this very moment. Take it away, Laura! I love green tea. I’ve been drinking it nearly everyday for years. So when I found out that one of my favorite things in the world could also be used for skin care, I signed up right away. When I make this toner, I just brew my normal cup and leave some in the pot to steep longer. You can use any green tea you want. Really. Anything from Twinnings to Tazo to the most rare and luxurious brew found at Mariage Freres in Paris. Infused teas are great, too! I usually use Jasmine Pearl but I made my latest batch with peach green tea. The extra fruits or flowers commonly found in flavored teas just add more antioxidants. Now, some of you are asking, why tone at all? Toning after cleansing will do one very important thing - balance the ph level of your skin. This helps prevent acne and blackheads and keeps the skin from drying out. The ingredients in this toner are also packed with amino acids, potassium, alpha-hydroxy, antioxidants and they stimulate blood flow and circulation. Basically, this toner controls bacteria and reduces toxins so that your skin can repair itself naturally! Over time you will also have glowing skin! We all want glowing skin. There are 2 versions of this toner. The first one must be refrigerated. The second has the addition of essential oils and a carrier oil (these act as a preservative) and will keep for up to 2 weeks at room temperature, and if refrigerated, one month. The green tea of your choice, brewed for 15 minutes. To make the standard toner, combine all ingredients in the bottle in equal amounts. For the 2 oz. bottle I have, I use 2 teaspoons of each ingredient. Then shake and apply with a cotton ball. Store this toner in the refrigerator! Use within one month. All ingredients for toner #1. Combine the ingredients in the glass bottle the same way as instructed to make toner #1. Then add the oils. Shake! If you store this toner in your bathroom, make a batch every 2 weeks. I just put it on my calendar. 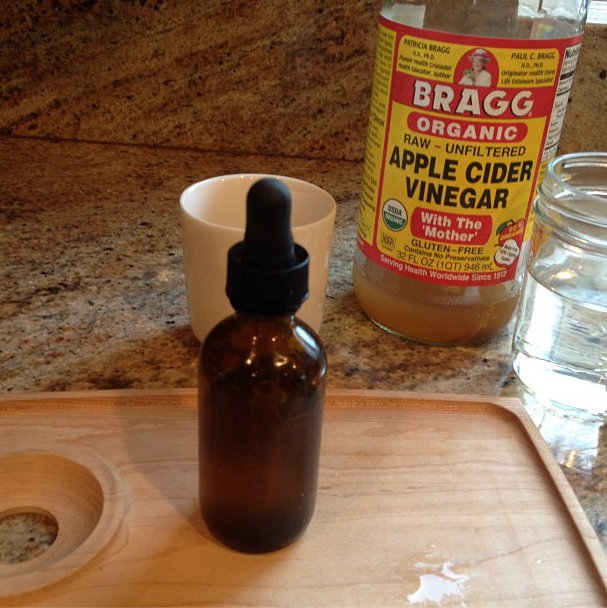 If your skin is dry, reduce the amount of apple cider vinegar and increase the amount of water. 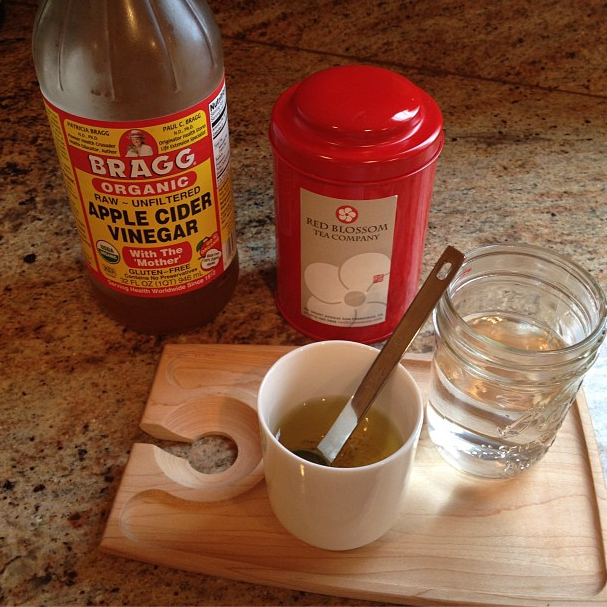 If your skin is very oily, you can increase the amount of ACV and decrease the amount of water. If you’re skin is sensitive or you’re using this on pre-teens, decrease the amount of ACV and increase the amount of the green tea. You really have to just play with it. For my combination skin with hormonal break-outs, the equal parts work best. Let’s talk about the apple cider vinegar. I can get the Bragg brand at my local health food store for around $3.00 a bottle. It’s a bit more for the large bottle in my picture. If you can’t find this where you live, you can purchase it online. Any other brand is fine as long as it’s organic and unfiltered. This type of ACV will have particles and a type of pulp at the bottom. This is the good stuff and packed with vitamins! Don’t filter it out! Rinse berries of all types after you buy them in a solution of one part ACV to ten parts water. This will keep the berries fresh for up to 2 weeks in your refrigerator! The Bragg website has tons of other recipes and ideas. If you start to make your own skin care, you will begin to see how the natural ingredients used can be used in so many other ways. If you decide to try this and have questions, leave a comment and I’ll answer it as best I can. Thank you again, Laura! I hope you've all enjoyed the weekly lesson from her. Yes we all want glowing skin! I currently use a rose water toner from Kiehls which I love. I wouldn't mind trying a DIY toner formulation though. Thanks for sharing your "recipe" Laura and for sharing this with us Marlene! What a lovely addition with the green tea--I've just been using straight up braggs--I will definitely be trying this soon, my friend! A lot of people use Braggs on its own. The tea keeps it from being too harsh and adds loads of vitamins. Good luck! I loves the serum you posted about (habe it bookmarked for when I run out of my current products) and this toner as well (I never really used one before..). I hate how many ingredients are in store-bought products that I use on my face and that I often know about 1 of 100 things. I usually buy organic scincare but after reading that a white cream is not really anything natural is not supposed to be white because there are no white things in nature. True! I'm glad you're going to give it a go! My skin never really got better until I ditched the soaps and creams. I love the Liz Earle toner if I use one at all. I honestly though splashing your face with cold water did exactly the same thing i.e. close your pores? Thats all I ever do! I haven't done any toner for a while ... okay ... years. I've only just started using a serum as the photos I take of myself scare me. I haven't used toner in forever and day, but I'd totally try out this one! Thanks for sharing! Thanks for this tutorial, I never knew you could make your own toner! Extremely useful information. I too DIY some of my skincare or purchase them direct from wholesalers and decant them into smaller containers. Now the million dollar question: Do any of you wash/rinse the new containers before using them or use them as it is and pray nothing bad happens (I do that sometimes)? By the way, my recent Paris and London trip was a blast (but trying to squeeze 2 cities into 9 days was tiring) and I went to "Xi Zhao" too! I've done both and haven't noticed a difference. The tea tree oil seems to kill everything!! That stuff is crazy! Laura, this is awesome - thank you!! I am so going to make this!! As natural as it can be. Toner and i seem to live in different worlds cuz i dont use it either. With this recipe, i am willing to go extra miles. Yipee! Let us know how it works!